The first convoy of food aid has been sent into rebel controlled northern Sri Lanka since the UN and other agencies were ordered out in mid-September. Aid agencies estimate about 200,000 people have been displaced by fighting in areas held by the Tamil Tigers. 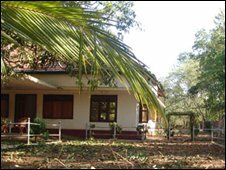 Meanwhile the air force says it has bombed what it called the Tigers' main headquarters, near Kilinochchi town. But the Tigers say the air force hit buildings of its political wing in the town itself. The Tigers also say houses nearby were hit and that two civilians were killed. The army earlier this week said that it was moving closer towards capturing the town after "intensive fighting". Fifty-one trucks carrying around 650 tonnes of food passed through the crossing point at Omanthai into territory controlled by the Tamil Tigers. 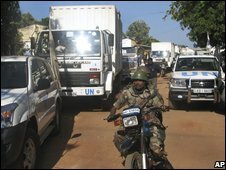 The convoy was organised by the government and the UN. Nine lorries hired by the government were not allowed to go after the security forces discovered explosives, global positioning system sets and a large number of batteries. The food is the first to be sent since the UN and other aid agencies were ordered out of rebel areas by the government. Some international humanitarian workers accompanied the convoy before they returned to Vavuniya which is under government control. Azeb Asrat from the UN's World Food Programme says there are a large number of people in Tamil Tiger areas who have been displaced by the fighting. "The food is needed," he said, "because 200,000 internally displaced people are waiting. The last distribution was done around 15 September, so it's already two weeks that people have been without food." Sri Lanka's military is continuing an offensive aimed at capturing territory controlled by the Tigers and ending their fight for a separate state for the ethnic Tamil minority. According to the military, soldiers are now only 3.5km (two miles) from the outskirts of Kilinochchi. But with journalists barred from the area the claims cannot be independently verified.